Achievements: Started Missionaries of Charity in 1950; received Nobel Prize for Peace in 1979; received Bharat Ratna in 1980. Mother Teresa was one of the great servants of humanity. She was an Albanian Catholic nun who came to India and founded the Missionaries of Charity in Kolkata. Later on Mother Teresa attained Indian citizenship. Her selfless work among the poverty-stricken people of Kolkata (Calcutta) is an inspiration for people all over the world and she was honored with Nobel Prize for her work. 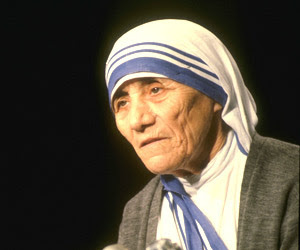 Mother Teresa's original name was Agnes Gonxha Bojaxhiu. She was born on August 27, 1910 in Skopje, Macedonia. Her father was a successful merchant and she was youngest of the three siblings. At the age of 12, she decided that she wanted to be a missionary and spread the love of Christ. At the age of 18 she left her parental home in Skopje and joined the Sisters of Loreto, an Irish community of nuns with missions in India. After a few months of training at the Institute of the Blessed Virgin Mary in Dublin Mother Teresa came to India. On May 24, 1931, she took her initial vows as a nun. From 1931 to 1948, Mother Teresa taught geography and catechism at St. Mary's High School in Calcutta. However, the prevailing poverty in Calcutta had a deep impact on Mother Teresa's mind and in 1948, she received permission from her superiors to leave the convent school and devote herself to working among the poorest of the poor in the slums of Calcutta. After a short course with the Medical Mission Sisters in Patna, she returned to Calcutta and found temporary lodging with the Little Sisters of the Poor. She started an open-air school for homeless children. Soon she was joined by voluntary helpers, and she received financial support from church organizations and the municipal authorities. On October 7, 1950, Mother Teresa received permission from the Vatican to start her own order. Vatican originally labeled the order as the Diocesan Congregation of the Calcutta Diocese, and it later came to known as the "Missionaries of Charity". The primary task of the Missionaries of Charity was to take care of those persons who nobody was prepared to look after. The Missionaries of Charity, which began as a small Order with 12 members in Calcutta, today has more than 4,000 nuns running orphanages, AIDS hospices, charity centres worldwide, and caring for refugees, the blind, disabled, aged, alcoholics, the poor and homeless and victims of floods, epidemics and famine in Asia, Africa, Latin America, North America, Poland, and Australia. In 1965, by granting a Decree of Praise, Pope Paul VI granted Mother Teresa permission to expand her order to other countries. The order's first house outside India was in Venezuela. Presently, the "Missionaries of Charity" has presence in more than 100 countries. Mother Teresa's work has been recognised and acclaimed throughout the world and she has received a number of awards and distinctions. These include the Pope John XXIII Peace Prize (1971), Nehru Prize for Promotion of International Peace & Understanding (1972), Balzan Prize (1978), Nobel Peace Prize (1979) and Bharat Ratna (1980). On March 13, 1997, Mother Teresa stepped down from the head of Missionaries of Charity and died on September 5, 1997, just 9 days after her 87th birthday. Following Mother Teresa's death, the Holy See began the process of beatification, the second step towards possible canonization, or sainthood. This process requires the documentation of a miracle performed from the intercession of Mother Teresa. In 2002, the Vatican recognized as a miracle the healing of a tumor in the abdomen of an Indian woman, Monica Besra, following the application of a locket containing Teresa's picture. Monica Besra said that a beam of light emanated from the picture, curing the cancerous tumor. Mother Teresa was formally beatified by Pope John Paul II on October 19, 2003 with the title Blessed Teresa of Calcutta. A second miracle is required for her to proceed to canonization.